﻿ Best Price on Casa Condado Hotel in San Juan + Reviews! This small boutique hotel in San Juan is one block from Condado Beach. The hotel offers free Wi-Fi in all areas and an on-site restaurant. Complimentary breakfast is included. Casa Condado Hotel features a terrace on the second floor and the hotel's Primitivo Condado Restaurant, which serves seafood and Puerto Rican cuisine. A courtesy risotto tapa and mojito at the restaurant El Asador in Old San Juan is included. Guest rooms at the Casa Condado feature air conditioning and sitting areas. Private bathrooms are also included. The Old San Juan historic district is only minutes from the Casa Condado Hotel. Guests can also visit the nearby Ell Morro fortress. Photo identification and credit card are required at check-in. All special requests are subject to availability. Special requests can't be guaranteed and may incur additional charges. Please note there is no elevator available. The 2nd and 3rd floors are reached by the stairs. Very friendly Staff! Many restaurant and shops close by the Hotel area! I had dinner in the hotel restaurant and was very good and fresh food I enjoyed! Very good value for the money you pay and for the rates around San Juan area! The A/C was not adjustable so you'd end up sleeping for a few hours then get up and turn it off. It was noisy as well. But the common area was very nice and there's CVS and Walgreen right down the street. Smaller scale hotel, relatively new, modern design. Asian-owned, with asian restaurant, and popular with asian clientele. Breakfast included was very minimal, internet erratic, for the most part non-functional. Air conditioner noisy, and constantly cycling on and off. Difficult to sleep in this room. The place looks good, but doesn't quite work. Staff is responsive, bathroom is good with amenities first-rate. Overall, would not repeat here. Stayed there just one night, but I was amazed that our room was looking more like an apartment. 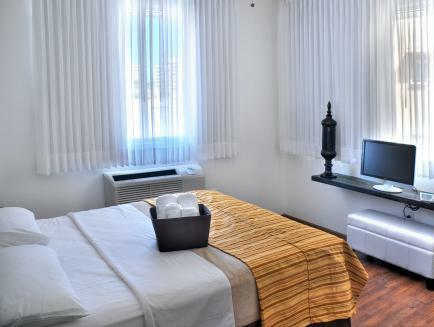 The hotel has fresh look and nice big clean with wooden floors. Staff is friendly. Very good, breakfast was a little too ordinary with only cereals and breads etc. but clean rooms, friendly stsff reasonable price. In general the stay is pleasant. The staff is very friendly and helpful. However, the parking there is a issue. You need to park your car in a parking lot a block away from the hotel, and it charges $15 per day. The hotel location is not bad, close to some restaurants within walking distance. The beach is close as well. Place was basically clean. There was mildew on our shower curtain. The rooms were hot. The a/c would flip on and off noisily all night. There was no place to store our luggage. Breakfast was continental. Clean. Shower floor needed painted. Air conditioner was noisy and the room was hot. This hotel feels like a hostel that has moved on to graduate school. It is clean, well decorated, has a minimal breakfast offering to tide you over until you can have a proper meal (there are bagels, toast, cereal and other pastries to choose from). One of the great features that I found as a pleasant surprise was that this hotel offers Rusk toiletries. If you are looking to stay in Condado, this place is perfect. for the price you pay it's a great deal. the room and facility are clean and well kept. it is not super fancy but i found it to be comfortable and convenient. i'm very pleased with my stay, i didn't mind having to walk up and down the stairs and the staff was very kind and helped me with my luggage both when i came to the hotel and when i left. i also liked that they gave quality shampoo (rusk). i liked their clean minimalist decor and thought i had plenty of space to put and store my things. could use a mini fridge but that is no big deal compared to everything else that they offer. would highly recommend a stay here, but if you are looking for a luxurious 5 star hotel this is not for you. no pool, no spa, no extra works, no vip treatment. but i'm a simple gal so this works for me! the stay was great. the receptionists were nice, warm and helpful. for the price, though, i think the room was below what i would regard as standard. i stayed in a hotel in washington and the room was larger and had a small refrigerator, wardrobe and other amenities which were lacking in the hotel in question. breakfast was not adequate - no eggs! some people cannot start the morning without eggs. i have nothing to complain. the location was great, the price was reasonable, and services were great too. but if you want to go to old san juan, then it's a bit far away. staff was friendly and courteous. helpful in suggesting restaurants and getting around town. 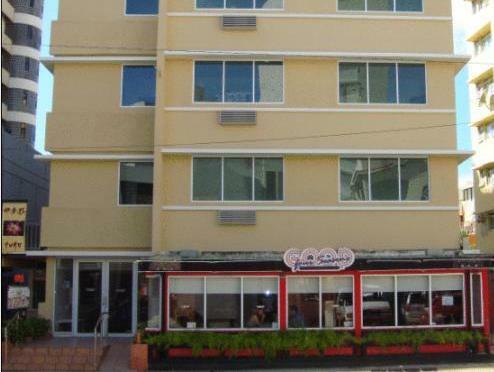 only a few blocks from the main street of condado with all the casinos, restaurants and bars. just a few blocks to the beach. rooms were small but clean. needed some assistance with the room safe and only waited a few minutes before maintenance arrived. this is a no frills hotel but a good bargain. 직원은 친절하나 샤워실등의 여건은 좋지 않습니다.